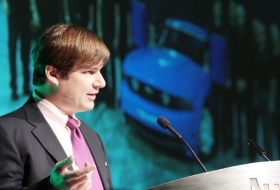 Ford marketing chief Jim Farley speaks at the Automotive News World Congress today. DETROIT -- Ford Motor Co. will trumpet fuel economy gains as it tries to win back customers this year. Fuel efficiency and technology offerings will be a main thrust of the companys marketing and public relations efforts this year, Ford marketing chief Jim Farley said today at the Automotive News World Congress. For years, fuel economy has been a reason for customers not to buy a Ford, said Farley, group vice president of marketing and communications. Now, he said, Fords engineers have vowed that new or redesigned vehicles will have best-in-class or equivalent fuel economy. By putting six-speed transmissions in all Ford vehicles by 2012 and offering EcoBoost engines in 90 percent of its nameplates by 2013, Ford will deliver affordable fuel economy to millions, he said. Fords marketers now must make sure consumers know about those efforts, Farley said. EcoBoost, which adds turbocharging and direct injection to gasoline engines, allows Ford to reduce engine size and can provide as much as a 20 percent gain in fuel economy, he said. He touted the 2010 Ford Fusion sedan as one of this years vehicle launches that will focus on fuel economy. The 2010 Fusion boasts highway fuel economy of up to 34 mpg; a new hybrid version is rated for city fuel economy of up to 41 mpg. But 2009 also will be challenging as sales stagnate. After looking better than expected during the first 10 days of the month, January sales seemed to weaken over the past weekend, Farley said. Ford now expects January sales to be in line with previous expectations. Ford has said it expects industry sales rates to stay in the mid-10 million-unit range through the first quarter. While Ford expects a sales lift in the year, its forecast for 2009 industry sales was lowered. Ford now expects U.S. light-vehicle sales in the range of 11.7 million to 12.2 million vehicles this year, spokesman Mark Truby said. In December, Ford told Congress that it was assuming 2009 light-vehicle sales of 12.2 million. For now, Ford is sticking with its plan to avoid taking direct government loans, Farley said. But that could change if sales worsen.